Deep down inside we all know, not matter how old we get it’s never too late to find true love. It is this part of the ‘unchanging, timeless you’ that experiences the magical tingle of excitement at the thought of new romantic possibilities. 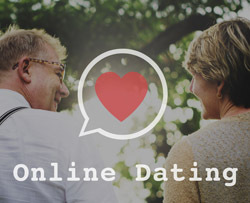 When the inner teenager wears out and you are ready to keep aside all the negative messages aimed at adults it’s time to date again and all thanks to the number of dating site for seniors, finding your love at any point, at any age in your life has never been simpler. Finding your partner online was once considered as a novelty, however this phenomena has now become a rather common if not dominant way of getting introduced to new partners, especially among the 40-70 year old individuals. Back in the day people most likely met their Mr. or Ms. Right in college, on the job, maybe in a bar or though family and friends. Today, people are increasingly getting together through a number of easily accessible and user friendly online dating sites and dating apps for seniors. Here are a number of tips that could help you find your true love online in an efficient, effective and safe way using the online dating option. BE TOTALLY READY- Get rid of the anger of the past relationship and be ready to move forward into a loving and healthy one. It is most important to feel positive, open and up for an adventure. If you’re having trouble getting to the right mental space, you might consider seeing a therapist before you get going. DO YOUR RESEARCH- There are a number of online dating sites and of all kinds. While some offer free services, many other charge a fee to gain access to the other members. Some of the best pay online dating sites like Match.com and fitsingles.com and asianfriend.com offer all kind of boutique services to better target your dream date. You can then choose the one that suits your need and budget and run along on your dream journey. TAKE CARE OF YOUR PRIVACY –Take opinions from a friend when picking out the perfect profile picture or filling out a profile form. Sometimes what might look like the best to you may send out the wrong message to another person. What you may consider to be a short, enticing rendition about yourself may come across as arrogant or too timid, or has too much about your kids and not enough about you. TAKE YOUR TIME- You need to be super cautious since you will be meeting people from outside your network. At first, no matter how sincere he or she may seem, don’t automatically trust everything that your date tells you. It takes time to be sure that this person is actually who he says he is and is being honest about his intentions. On the other hand you should be honest about what you’re looking for in terms of a relationship, too.